Brig. 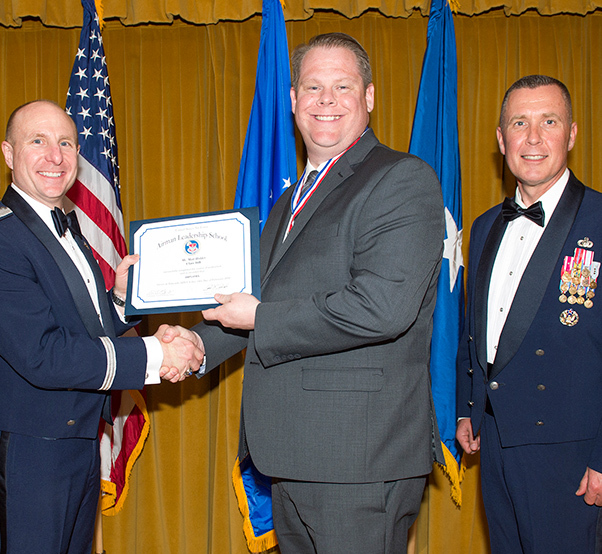 Gen. Carl Schaefer, 412th Test Wing commander (left), shakes hands with Matt Holder, 412th Communications Squadron, one of two civilians to graduate from Airman Leadership School Feb. 11. They are joined on stage by Chief Master Sgt. David Smith, 412th Test Wing command chief. 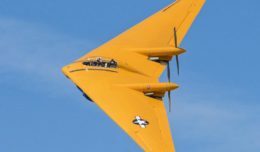 This particular class was unique because it included two civilians among the graduates, Matt Holder, 412th Communications Squadron, and Christopher Allen, 912th Aircraft Maintenance Squadron. According to ALS commandant, Master Sgt. Daniel Magas, civilians were incorporated into the school in an effort to bridge the gap within the “Total Force” arena. Civilian directors and supervisors for young Airmen are not uncommon, but the civilian leaders were never offered the same education that the young senior airmen they supervise were offered. “My efforts here at Edwards give those civilians the ability to develop their Airmen in depth,” said Magas. Brig. Gen. Carl Schaefer, 412th Test Wing commander, shakes hands with Christopher Allen, 912th Aircraft Maintenance Squadron, one of two civilians to graduate from Airman Leadership School Feb. 11. They are joined on stage by Chief Master Sgt. 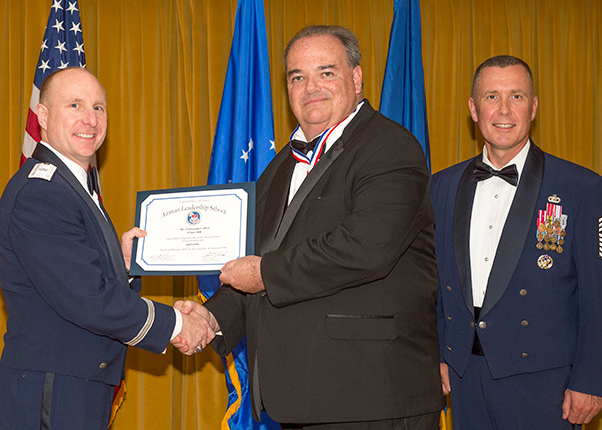 David Smith, 412th Test Wing command chief. According to Magas, Allen and Holder were the first civilians to graduate from ALS in Air Force Materiel Command. Allen applied for a spot in ALS after seeing an e-mail that civilians try for a spot in the class. He submitted his resume along with a letter of recommendation from his group commander. Ultimately, Brig. Gen. Carl Schaefer, 412th Test Wing commander, chose him and Holder as the first attendees. In the class they were expected to complete the same course curriculum as the military students, from written class work and oral presentations to close-order drills. “[We] were held to the same academic and dress and appearance standards. We were cut some slack in that we didn’t have to meet physical training standards, but we still had to participate in PT as best as we could,” said Allen. According to Magas, civilian students fall into the same reporting category as sister service attendees. All ALS students follow one standard for all areas of the curriculum with no exceptions. Holder never served in the military and applied for the school to gain more experience working with military members and to become a better leader. Allen saw it as an opportunity to improve himself professionally. “It turned out that not only did I improve as an employee, but also as a person, by going through ALS,” said Allen. Both graduates agreed that they became better leaders in the course with both military and civilian co-workers. Airman Leadership School graduates stand up before the audience during their graduation ceremony at Club Muroc Feb. 11. Among the class were the first two civilian graduates here at Edwards AFB. ALS is a five-week United States Air Force program designed to develop airmen into effective front-line supervisors. It is the first professional military education that enlisted Air Force members encounter. ALS focuses on developing leadership abilities, the profession of arms and building effective communication. 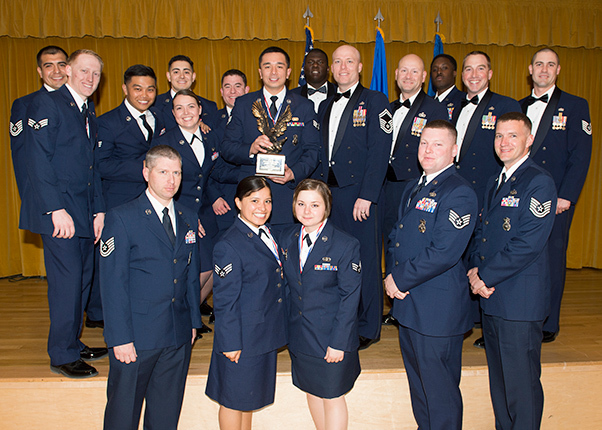 The Airman Leadership School congratulated a new class of graduates Feb. 11 during a ceremony at Club Muroc.